This week marks the 210th birthday of Charles Darwin who, according to Scientific American, proposed the most powerful idea in science. International Darwin Day (February 12) was established in 2005 to inspire people throughout the globe to reflect and act on the principles of intellectual bravery, perpetual curiosity, scientific thinking, and hunger for truth as embodied by the evolutionist. 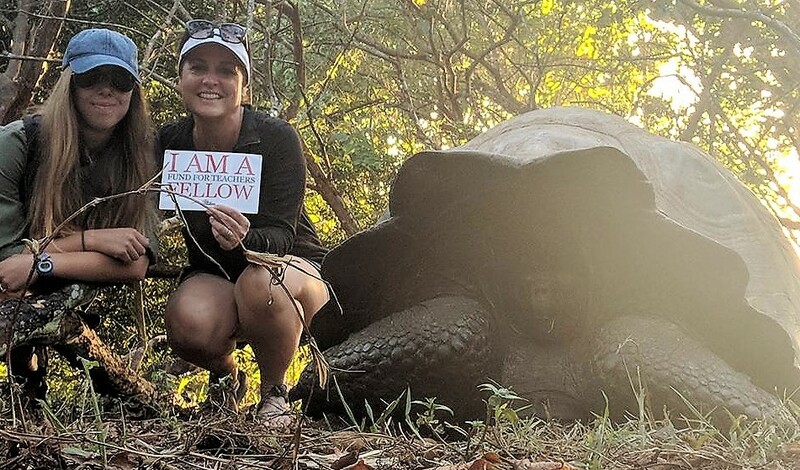 More than 80 FFT Fellows have pursued knowledge and insights in the Galapagos Islands, where Darwin formed his thinking on evolution. Last summer, Mike Sustin (West Geauga High School – Chesterland, OH) investigated with professional scientists and interpretive naturalists from National Geographic the diverse ecosystems of the Galapagos Islands. From the Cotopaxi Volcano, roughly 15,000 ft above sea level, to the giant tortoises on Isla Fernandina, he drew parallels between current environment issues near his school for case studies in Environmental Science, Earth & Space Science and General Chemistry classes. 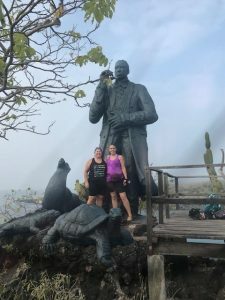 Lisa and Megan by the sculpture commemorating Darwin’s arrival in the Galapagos. “How paramount the future is to the present,” said Darwin, “when one is surrounded by children.” Our Fellows personify this quote as they strive to engage and inform those who follow after us. Today we honor these 2018 Fellows with Darwin-focused fellowships, but you can review all of the grant recipients who learned in the Galapagos by visiting the project search on our website. 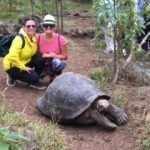 Jill Kehoe & Katherine Martens (Chicago) joined a teacher-only expedition to the Galapagos Islands to become more aware of global environmental initiatives and inspire students’ personal passion projects aimed at protecting our planet. 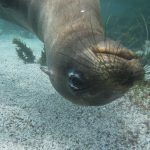 Image snapped by Laurie Matthews (Brooklyn) while snorkeling with scientists and sea lions at The Charles Darwin Institute. 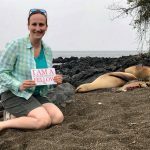 Tiffany Haley (US Air Force High School) joined a Galapagos Islands teacher expedition researching how unique animals & plants overcame environmental pressures and apply this to nonliving design problems and enrich both architecture and science courses. Photo Above: The teaching team of Debra Brewer and Haley Lukes who explored environmental extremes involved in the development of civilizations and species in Peru, Ecuador, and the Galapagos Islands to improve students’ connections between cultural and biological evolution.